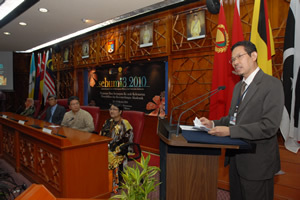 BANGI, 12 Oktober, 2010 – Universiti Kebangsaan Malaysia (UKM) and Universitas Indonesia (UI) can work together to bring about a transformation of minds of the Indonesians and Malaysians to be more rational and mature on their bilateral relationship, said Prof Ir.Dr Hasan Basri. The Deputy Vice Chancellor (Academic and International Affairs) UKM said the two countries do not have a choice other than striving to strengthen their resolve to exist as neighbours which could bring about prosperity to both nations and peoples. Speaking at the launching ceremony of a joint seminar organised by UKM and UI, SEBUMI 3, here today, he said various academic programmes between the two universities needed to be upgraded to achieve the objective,. UKM, he said, would welcome the involvement of academic staffs from Indonesia to collaborate in carrying out research in the eight niche activities of UKM. The two day seminar, he said, was important considering that it was organised at such trying time when both countries were facing onerous challenging issues that needed to be overcome. “During this era of globalisation we see the flow of information bombarding our mind with various kinds of information be they be positive, negative, balanced or neutral. The information disseminated can influence the perception of the population, society and the state. “Various approaches can be made to face the issues. 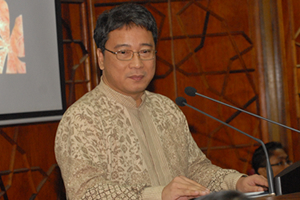 One of the most effective is the academic medium like SEBUMI which can help to cool down an explosive situation. “This is because scholars are rational thinking people who are not easily swayed by extremists and unhelpful views,”he said. Launching the seminar, the Executive Chairman of Utusan Melayu (Malaysia) Berhad, Tan Sri Mohamed Hashim Ahmad Makaruddin noted how the mass media had recently highlighted a few untoward incidents that had adversely affected relationship between the two countries and their peoples. What happened had disturbed the close relationship that existed for a long time between them. “As neighbouring countries with their population having close co-operation respecting and appreciating each others’ contributions would definitely ensure a stable region living in peace and harmony. “It is unfortunate that this strategic relationship has been tarnished by our own misdoing or perhaps the involvement of third parties who liked to drive a wedge and create suspicion between us thereby affecting our close relationships which had in fact existed since a long ago,” he said. 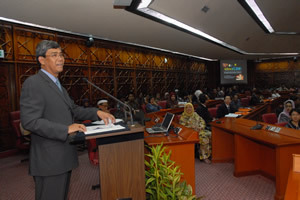 Tan Sri Hashim, who is also the Adjunct Professor at the School of Media and Communication Studies, was confident the close co-operation that had resulted in the holding of the seminar would be able to come up with resolutions on how to continue safeguarding and strengthening the close relationship between the two countries. He also suggested research on regional issues be carried out on jointly between UKM and UI for a more holistic solution that is beneficial to both countries. Scholars from both institutions can also be good peace communicators to help reduce tension and misunderstanding between Malaysians and Indonesians. More than 100 working papers on various topics on regional issues were discussed at the seminar.